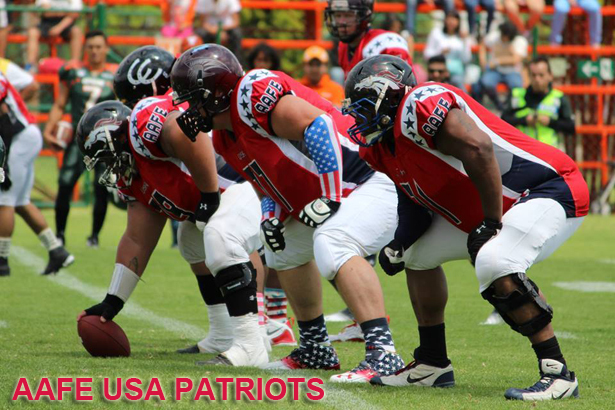 AAFE USA PATRIOTS (semi-pro) vs. BULLDOGS F.A. with additional players from the 2015 FEFACR: Federación de Fútbol Americano de Costa Rica teams: TOROS F.C., Perez Zeledon PREDATORS F.A. and San Jose TITANS F.A. faced each other on Saturday, May 2nd at Garabito Stadium, Jaco Beach. AAFE is a sports management and marketing company, specializing in providing opportunities for athletes to showcase their skills and participate in one of a kind events, from International All-Star games to professional tryouts & scouting combines. AAFE is committed to the advancement of football beyond the US borders, through X-Cite Sports, they have built a strong relationship with the four time Div. I champions of Costa Rica. • Perez Zeledon PREDATORS F.A. • San Jose TITANS F.A. Perez Zeledon PREDATORS players participating on the BULLDOGS F.A. team for Caribbean Bowl III. First time for the PREDATORS players competing in an international game.